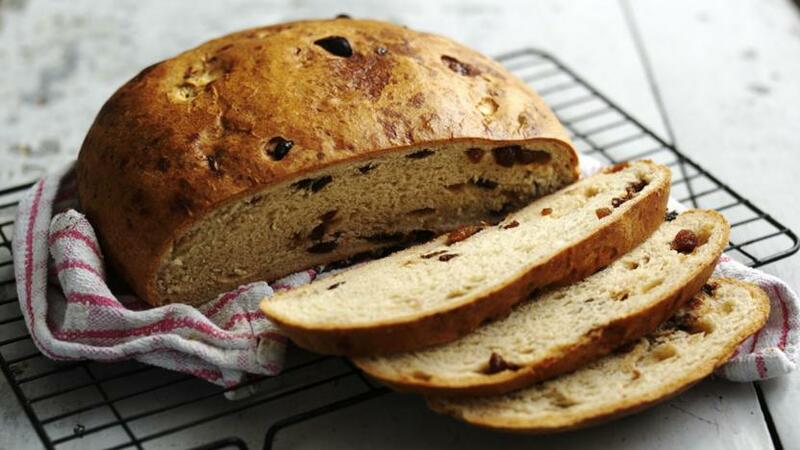 This slightly sweet, fruit loaf is excellent as partner to cheese or with a strong cup of tea. Mix together the yeast, caster sugar and 250ml/9fl oz lukewarm water in a large bowl. Leave to stand for 10 minutes until the mixture is frothy. Add the flour and butter and mix thoroughly. Tip onto a lightly floured surface and knead for about five minutes to form a smooth elastic dough. Place the dough into a clean, lightly oiled bowl and cover with a damp tea towel. Leave to prove in a warm place for about one hour or until doubled in size. When the dough has risen, remove the tea towel and punch the dough down. Tip onto a lightly floured surface and knead in the fruit and muscovado sugar until well combined. Shape the dough into a round shape and place on a lightly greased baking sheet. Cover again with a damp tea towel and leave to rise in a warm place again for 30 minutes or until it has doubled in size. Brush the bannock with a little beaten egg to glaze. Bake for 45-50 minutes until risen and a rich brown colour. If the bread is getting too dark, cover lightly with parchment paper or foil. When the bread is ready it should sound hollow when the underneath is tapped gently. Leave to cool slightly before slicing and serving warm with plenty of butter.